If you are yet to read the novel, this post does include spoilers! 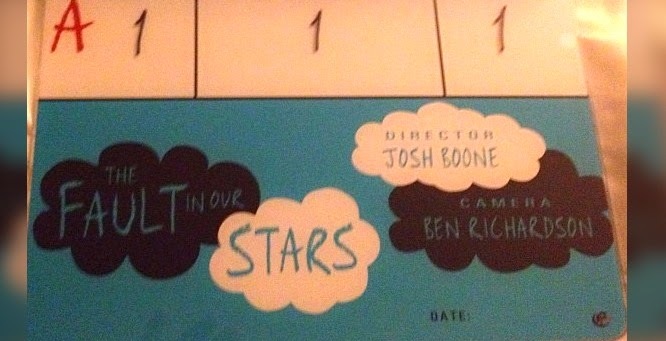 Yesterday, I booked my tickets for the advanced screenings of The Fault in Our Stars being held next Thursday in the UK(#FeelItFirst), which I couldn't be more excited for. In January last year, I picked up John Green's novel and had my heart cracked like a glass into fragments that I couldn't retrieve. That I still can't retrieve. Having followed this book to movie adaptation since the moment Shailene Woodley was announced as playing Hazel, there are a lot of scenes I'm looking forward to seeing, especially after the faultless trailer that debuted a few months ago - which added to my expectations of the movie. They can't really get much higher. It's been a while since I read the book, admittedly, and with no time to reread, there are definitely things I may have forgotten. However, when sitting in the cinema next week, I'll be waiting to see how the leads bring the characters to life - and the attention to detail throughout the film. In the trailer, Hazel's canulla is always there, and I absolutely love this. It's an honest representation of illness; exactly what the book sets out to achieve. I, for one, also noted the oxygen tank Hazel pulls along, and I felt like applauding the team of people behind this film. When I first found out that Shailene and Ansel - who play brother and sister in Divergent - would be taking on the roles, I was worried. 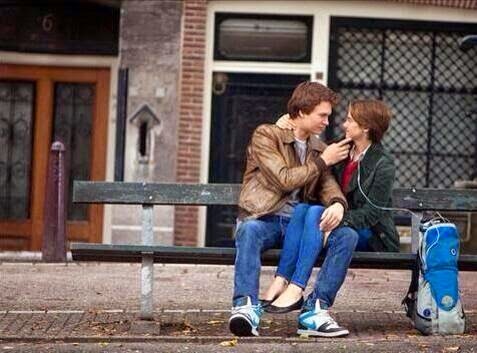 Would I be able to see them as Hazel and Gus? The two teenagers in a relationship? I think so. One of my favourites things about The Fault in Our Stars is how it shows that having an illness doesn't define a person. That we should see past the cannula Hazel wears, for example, as she lives An Imperial Affliction and obsession with America's Next Top Model are all what I want to see in the adaptation - it makes the characters real. Of course, I can't wait to see the first Cancer Kid Support Group, where we hear of Gus' fear of Oblivion. This is perfectly done in the trailer; but seeing the final cut is something I can't wait for. The Cancer Kid Support Group is where it all begins, and it leads straight into my favourite metaphor in the book: "You put the killing thing right between your teeth, but you don't give it the power to do its killing." After watching the clip that was released a few weeks ago, I'm a little hesitant, as Gus does come across quite arrogant. Although, John Green has assured us that the whole scene was cut to be shorter, so hopefully it will be how I pictured it. Issac's storyline is so powerful, and I can't wait to see Nat Wolff take it on; especially now it has been announced that he will be Quentin in the adaptation of 'Paper Towns'. My only worry is that the sub-plot with Monica, that is always present in the book, will only be skimmed over in the movie to keep non-readers interested. Honestly, I would welcome a five hour film if it meant that everything would be included. I've never seen a YA film with a character who is blind, so this is definitely going to be really interesting to see, and I have complete faith that this will be done well. Gus Waters. From his quote-filled family home to funky bones, and his level of wit and charisma, I'm brimming with excitement to see his character brought to life. How he breaks all of his football trophies, his pre-funeral and those phone calls with the familiar tagline, as they were the parts of the book that had me reaching for a box of tissues. On a lighter note, we're yet to see an image or still of Peter Van Houten in character, who seems to have been forgotten! With no idea of what Van Houten looks like in the film, I'm really anticipating his scenes, and the likes of Hazel and Gus visiting the Anne Frank House, and their meal out that we have seen in all of the trailers. Whilst reading, my particular favourite part of the book includes a 'paedophilic swing set', just for the humour and I'm hoping a certain Venn Diagram is featured! So, what scenes are you anticipating the most? When are you planning on seeing the movie? An advanced screening? Opening night? I don't know which scenes I'm anticipating the most - probably the meal in Oranjee and Hazel's pre-funeral speech - I wish I was going to see an advanced screening, unfortunately I can't get to one, but I intend on going to watch the film on the 21st June, the first Saturday the film is out and the day after it opens at my local cinema. Can't wait!!! Replying to this after I've seen the movie; which, admittedly, is a little strange! You're going to absolutely love it! My favourite scenes were in Amsterdam - and the pre-funeral speeches are beautiful! I'm so excited for this, even though I'm aware that I'm going to already be crying during the trailers... XD I love all the scenes in the book, so I can't imagine not enjoying a single second of the film- especially since everyone seems to love it so much! I'm going when it comes out, but I hope you have fun at the advanced screening! Don't forget the tissues! I think I cried most of the way through! It has the perfect mix of humourous and heart-breaking scenes! I actually did forget tissues! I had to try and stop sobbing! I completely forgot the tissues! Hope you enjoy!